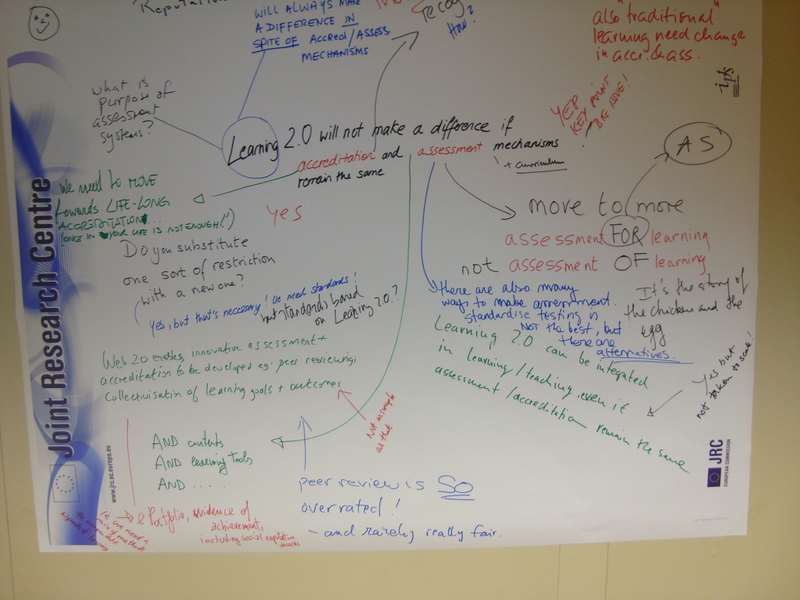 Another post on the IPTS seminar on Learning 2.0 in Seville. This workshop was interesting becuase it brought togther researchers and practitioners from all over Europe. And, somewhat to my surpise, there was a fair degree of consensus. We agreed social software provided many opportunties for creating, raher than passively consuming learning. We agreed that learnng opportunities were being developed outside the classroom. We even agreed that the locus of control was switching from institutions to the learners and that this might well be a good thing. We agreed we were moving towards individual learning pathways and that learners needed to be supported to finding their pathways. We agreed that the context of learning was important. Mobile learning would become increasingly important with the development of context sensitive devices. (Also see Serge Ravet’s post on User Generated Content or User Generated Contexts). But there were also limits to the consensus. Whilst there appeared agreement on new roles for teachers, no-one was sure what that role was? Much of the discussion centred on the scaffolding of learning. How much support did leaners need and how much of that support would come from teachers? Neither were participants agreed on the future role of institutions. 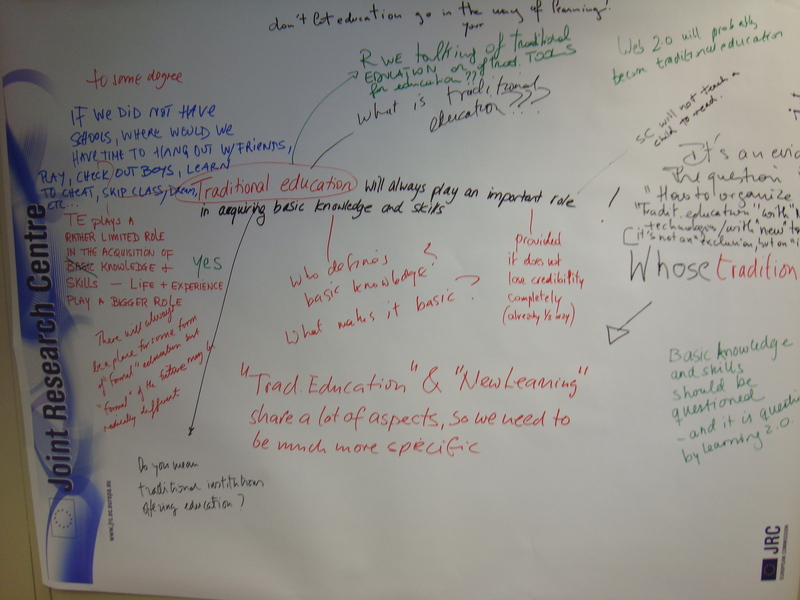 More critically, was Learning 2.0 something which happened outside the school, and had only a limited impact on institutional practice, or did it pose a fundamental challenge for the future of schooling? There was even greater disagreement over curriculum. Should there be a curriculum for basic skill and knowledge that everyone should learn? Did learners need a basic grounding in their subject before theyc oudl develop their own learning pathways? Who should define such a curriculum? What was the role of ‘experts’ and who were they anyway? And perhaps the greatest disagreement was over assessment and accreditation. Many of us felt that we needed to move towards community based formative assessment. Employers, we said, would be more interested in what people were able to do than formal certicates. Others, pointing to occupations such as doctors and plumbers felt there should be some form of standards against which people should be assessed and accredited. A final comment on the form of the project. Although the work is about Learning 2.0 the present form of the work is decidedly Research 1.0. This research is important enough that it needs to be opened out to the community. It seems a wiki is being d veloped and when it is up I will blog here about it. 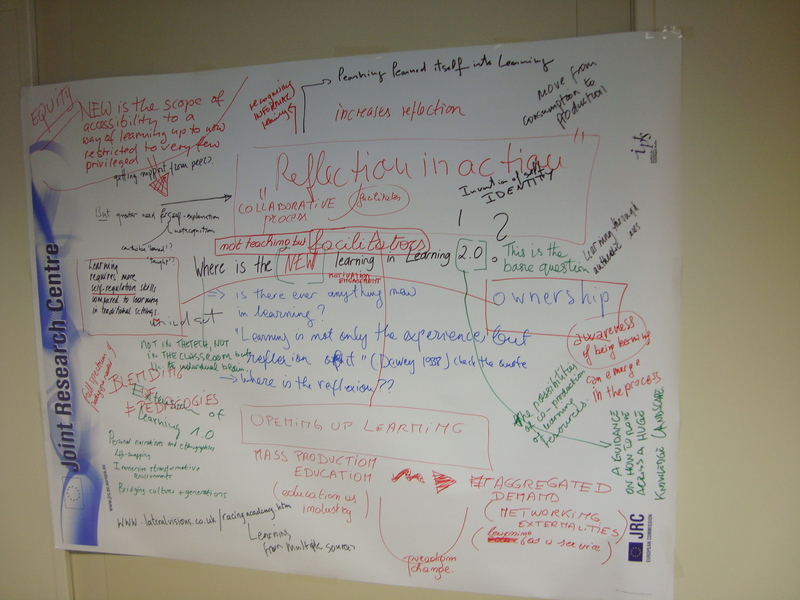 In the meantime here are some of the photos of the flip charts used for brainstorming around different issues at the workshop. I will pass on any comments on this post to the project organisers. 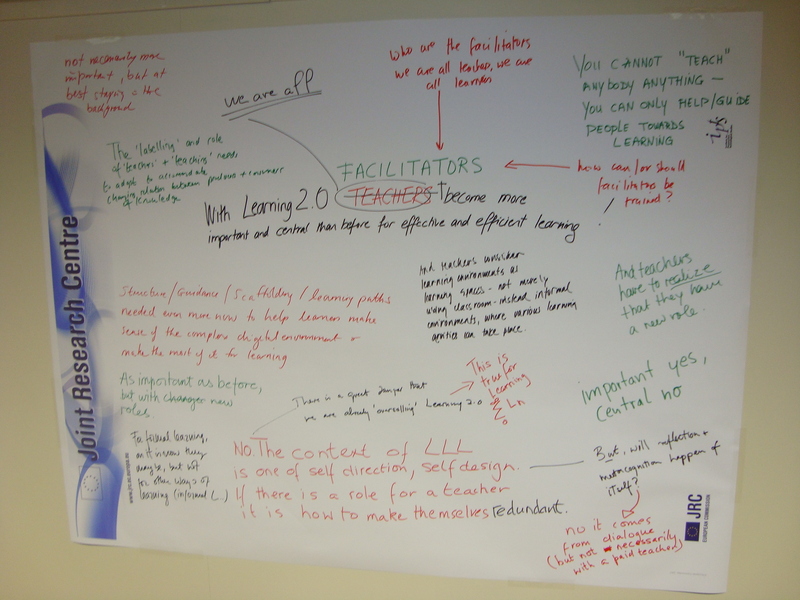 I am still at the IPTS seminar on Learning 2.0 in Seville. Much of interest and I wil write a few more blogs on this. But one issue, which has just come up, is this of platforms. The director of IPTS has asked us what platforms we see being used in the future. And we have said – we know the platform. It is called the World Wide Web. I think that is very important. We do not need more and more platforms. We do need control over our own data and the ability to be able to develop and use that data. What technologies change people’s lives? There are some interesting issues kicking around at the IPTS workshop on the impact of Web 2.0 innovations on Education and Training in Europe. is it possible to change pedagogic processes and improve opportunities for learning through the use of social software within the present system? or as Roberto has just said what is the disruptive technology which can spark such chnage in peoples lives. It may be that such change will not origin within the education system but will happen from human interactions in the wider communities through different ‘value propostions’ – through ideas, approaches and technologies which add value to people lives. Are we hung up with systems approaches? As always it is the extra curricula activities which are the highpoint of conferences. And i don’t just mean in the bar. I had an interesting lunchtime conversation with Martin Owen where we were talking about the problems with the classificatory systems being put forward for analysing a database of practice examples developed for the IPTS study on the impact of Web 2.) innovations on education and training in Europe. One issue we discussed is the continued use of systems approaches for defining research design and analysis. All too often findings which do not fit into a pre-defined system are just viewed as ‘noise’ and therefore ignored. But it may be in that noise that cannot be analysed in a systems driven approach that the real issues lie. It is how learners are using social software that is critical to me and not how the system adapts or more often rejects the use of such software. Posted in e-learning 2.0, Innovation, research, Social Software, Wales Wide Web | Comments Off on Are we hung up with systems approaches? I am at a workshop on Learning 2.0: The impact of Web 2.0 Innovations on Education and Training organised by the Institute of Prospective Technology Studies in Seville. They have done a lot of work. however, I feel that in focusing on the use of technology for learning within the existing educational organisations they miss the main issues. 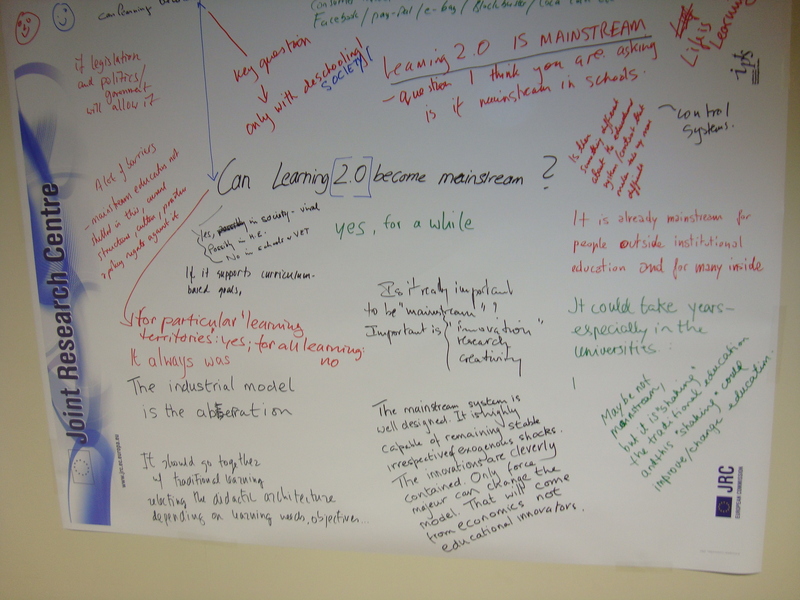 How do we bring together informal learning and learning from formal sources? How do people not enrolled on courses use technologies for learning? How do we transform institutions? How can we empower learners to structure their own learning? How can we open up educational resources – materials but not just resources – to the wider community. How also can we develop research designs and methodologies to address these issues? Martin Lindner raises some important issues in a recent blog post. “Even “e-Learning 2.0″ still seems to be discussed primarily from the perspective of institutions or organisations. But the Web 2.0 obviously is “user-centered”. Every This was the starting point for discussing “PLEs” (Personal Learning Environments) as opposed to LMSs (Learning Management Systems) and VLEs (VirtualLearinng Environments) that has been led by Scott Wilson, Leigh Blackall, Stephen Downes and many others in 2005. I have to say I worry when I hear people talking about PLE applications. But Martin makes the point himself in asking how we can help users to exploit the new possibilities – although in my view it is not just users with ‘low web literacy’ but all users. For this we need tools though I have long asked whether they should be regarded as social tools rather than learning tools. And learners need support in developing their own Personal Learning Environment to make the computer do what they want it to do for learning. Also we need to open out learning resources to ensure that they can be utlised within a PLE. Is instructional design dead? It depends I suppose on just what you mean by instructional design. Yes in the narrow meaning of the learning objects debates and in the heavily sequenced teacher controlled applications. But no if we are talking about designing materials to help people learn. Its just that more and more people are involved daily in instructional design and most of them without training themselves. Just witness the flourishing of videos on You Tube designed to show us how to do something! One final comment. Martin says “The ultimate learning environment is “the Web” itself.” No Martin, the ultimate learning environment is the world around us – which of course includes the web. But it also includes people, books and our (physical) working environment. One big challenge for the future is how to ensure such an environment is rich with learning possibilities. The next edition of our monthly Emerging Mondays Sounds of the Bazaar LIVE internet radio takes place next Monday 27 October at 1800 UK time, 1900 Central European Time. The programme will last for about an hour. The theme of the programme is Digital Identities. The programme notes are included below in this email. Plus our regular music and poetry spots, Cyber Gran Leila and surprise guest spots. How can you take part? You can just sit back and enjoy the show by going to http://icecast.commedia.org.uk:8000/emerge.mp3.m3u in your browser. This will open the LIVE radio stream in our MP3 player of choice. If you are feeling more active you can come on the show by phone or through skype. Just email or skype Graham Attwell – graham10 [at] mac [dot] com and we will bring you in. Or follow the show in our chatroom – http://tinyurl.com/soundschat (no account needed) where Cristina Costa will be hosting. I am surprised how little attention edubloggers have been paying to the collapse of the banking system and the ensuing credit crunch. Education does not exist in a vacuum, still less educational policy. So what does it all mean for education. Well one pretty obvious thing is that if different governments can afford to spend this much money on bailing out bankrupt banks, why has so little been spent on education globally. Imagine the effect of such mindbogglingly huge sums of money on education in less developed countries. Every child in the world could have a laptop with money to spare. However – there is no point in dreaming – banks will always be nearer the heart of lawmakers than education. The short term effects of the banking crisis for education could be quite grim. In any recession training is one of the first things to be cut by companies. And obviously there is likely to be a squeeze on public expenditure in the coming years to finance the loans to the banks. On the other hand the ideological fall out from the crisis coudl be extremely beneficial. I see education as likely to undergo profound – perhaps paradamatic – change in the next ten years with a change from homogeneous central curriculum determined classroom learning to individual learning pathways. I am enthusiastic about such change. But the danger whch has always concerned me has been the threat of privatisation. Depsite a history of publically finded and goverend education in Europe, we have seen the slow development of a private university sector in many European countries. And thw UK government has pursued an agenda of creeping privatisation through so called public-private partnerships and the encourgement of privately funded and goevrened trust schools. Ideologically they have encouraged the myth that business people know better how to run schools than do teachers or the local community. Industry has been handed control of vocational currcicula. That myth has now been blown sky high. Bankers are now a subject of derision rather than respect and rightly so. These are not the kind of people anyone would trust to run our schools. And I suspect that the companies so keen to invest in trust schools may now be forced to focus on their core business – rather than interfering in something they know nothing about. Furthermore, the banking crisis has restored the repsectability of public ownership. And rightly so – education should be owned by the community and free to learners. What we should now do is start to fight back and exmaine different models of community governance. Models which allow a community to shape the learning opportunities and the curricula to meet the needs of that community. Models that can extend access and opportunity for learning for all. Such a change could be far more important than the short term funding implications of the crisis. Pontydysgu is pleased to be involved with a series of Open Learning Events this autumn. Here is a quick run down of some of them. And you are all invited to particpate. So what does digital identity mean to you? Do you care? As more of our lives, from personal to professional activities, find their way online how do we cope with managing our fractured and distributed digital presence. Can we ever keep ‘personal’ separate from ‘professional’ when tools and services mash-up our online identities in ways that are beyond our control? What does this mean for the development of new literacies and new services that seek to put our identities back within our grasp.With live interviews, music, strong opinion, poetry, our very own edupunk granny Leila and more. We will be broadcasting *LIVE* from 1800 – 1900 UK time, (check your local time here: http://tinyurl.com/4jk76t ). Have an opinion or want to comment? Then drop us a line by email to graham10 [at] mac [dot] com or come and join us live in the chatroom where we will be discussing the contents of the show. Pontydysgu is happy to be supporting the first (as far as we know) on-line international conference on the training of trainers taking place on the 5 and 6 November 2008. The conference is for all those interested in the training and professional development of teachers and trainers. This includes teachers, trainers, tutors, researchers, managers and policy makers and other interested individuals. The conference will take place through the internet using the Elluminate conference tool. We hope this will not only reduce the carbon footprint of our activities, but will allow wide participation by those who might not be able to travel. A totally unConference event !!!! in Manchester / University of Salford. ThoughtFest 08 (Twemes: #TFest08) is a two-day event being organized by Pontydysgu with the support of the JISC Evolve network and the European Mature-IP project. The event will bring together researchers in Technology Enhanced Learning in an open forum to debate the current issues surrounding educational technologies and discuss how and where research impacts on practice and where practice drives research. 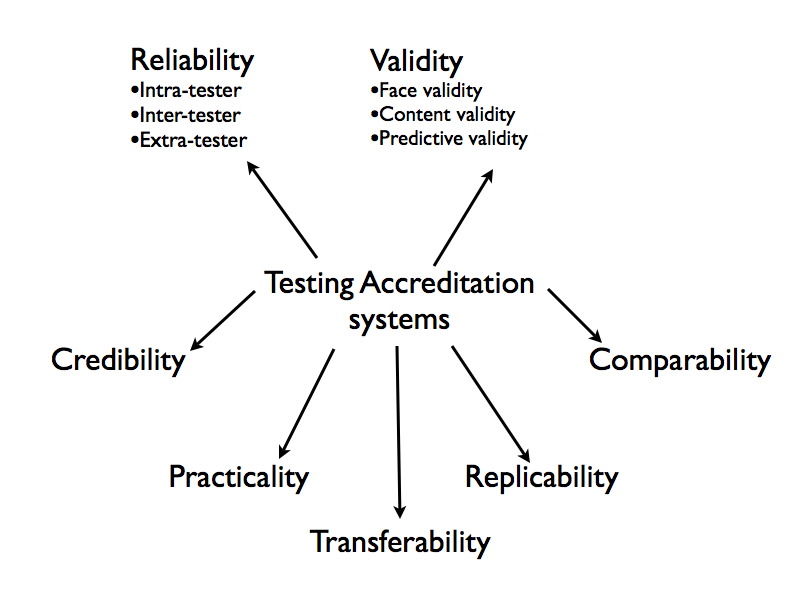 Can we develop an Open Accreditation system. What would we be looking for. In this post Jenny Hughes looks at criteria for a robust and effective cccreditation system. 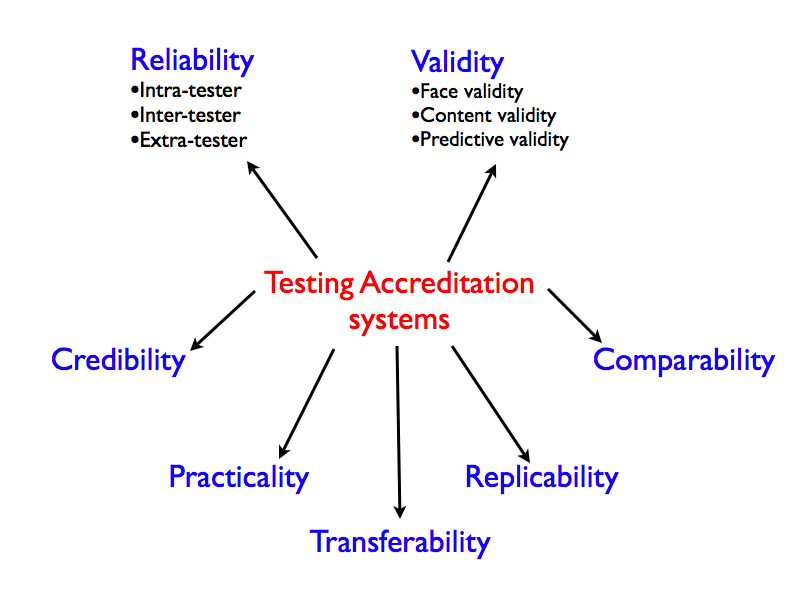 An accreditation system depends on the robustness of the assessment system on which it is based. Imagine you were in a shop that sold accreditation / assessment systems ‘off-the-peg” – what would criteria would you use if you went in to buy one? Reliability is a measure of consistency. A robust assessment system should be reliable; that is, it should be based on an assesssment process that yields the same results irrespective of who is conducting it or the environmental conditions under which it is taking place. Intra-tester reliability simply means that if the same asessor is assessing performance his or her judgement should be consistent and not influenced by, for example, another learner they might have just assessed or whether they feel unwell or just in a bad mood! Inter-tester reliability means that if two different assessors were given exactly the same questions, data collection tools, output data and so on, their conclusions should also be the same. Extra-tester reliability means that the assessor’s conclusions should not be influenced by extraneous circumstances, which should have no bearing on the assessment object. Validity is a measure of ‘appropriateness’ or ‘fitness for purpose’. There are three sorts of validity. Face validity implies a match between what is being assessed or tested and how that is being done. For example, if you are assessing how well someone can bake a cake or drive a car then you would probably want them to actually do it rather than write an essay about it! Content validity means that what you are testing is actually relevant, meaningful and appropriate and there is a match between what the learner is setting out to do and what is being assessed. If an assessment system has predictive validity it means that the results are still likely to hold true even under conditions that are different from the test conditions. For example, performance assessment of airline pilots who are trained to cope with emergency situations on a simulator must be very high on predictive validity. Ideally an assessment should be carried out and documented in a way which is transparent and which allows the assessment to be replicated by others to achieve the same outcomes. Some ‘subjectivist’ approaches to assessment would disagree, however. People actually have to believe in yourassessment! It needs to be authentic, honest, transparent and ethical. If you have even one group of stakeholders questioning the rigour of the assessment process or doubting the results or challenging the validity of the conclusions, the assessment loses credibility and is not worth doing. This means simply that however sophisticated and technically sound the assessment is, if it takes too much of people’s time or costs too much or is cumbersome to use or the products are inappropriate then it is not a good assessment system ! Although an assessment system should be customised to meet the needs of particular learning events, a good assessment system should also take into account the wider assessment ‘environment’ in which the learning is located. For example, if you are working in an environment where assessment is normally carried out by particular people (e.g teachers, lecturers) in a particular institution (e.g school or university) where ‘criteria reference assessment is the norm, then if you undertake a radically different type of assessment you may find that your audience will be less receptive and your results less acceptable. Similarly, if the learning that is being assessed is part of a wider system and everyone else is using a different system then this could mean that your input is ignored simply because it is too difficult to integrate. Also, if you are trying to compare performance from one year to the next or compare learning outcomes with other people, then this needs to be taken into account.